A comprehensive guide and fact sheet about King Narmer. 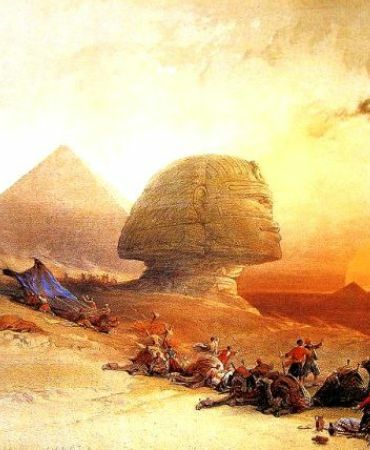 Discover fascinating facts and information about the pharaohs of ancient Egypt. Click a link for additional information and interesting facts about subjects relating to King Narmer, the greatest pharaohs of Egypt or other aspects of daily life, the people and places of ancient Egypt. The following profile provides a fast overview of Narmer - for additional information also refer to Menes. Interesting facts, biography & information about the life of Pharaoh Narmer, the ancient Egyptian King. The Pharaoh Narmer fact sheet provides details of the major events and accomplishments in his life, his consort and his family. Information about the dynasty and period in ancient Egyptian history in which King Narmer lived. Refer to Pharaohs for additional interesting facts and information. Fact 1 on Narmer: Name: This pharaoh of ancient Egypt is also associated with the legendary name of Menes. The identity of King Narmer is the subject of ongoing debate and some of the events for which he is credited have also been associated with his son, Hor-Aha, and the mysterious Menes. His Horus name is Iry Hor-Ka-Narmer. Fact 2 on Narmer: The Horus name was usually written in a serekh. The name of the king being written in hieroglyphs inside a representation of a palace. The serekh was the earliest convention used to set apart the royal name in ancient Egyptian iconography, before the cartouche was used. His name is attested in important artefacts and the graffiti around Hierakonpolis, Wadi Qash and Coptos. Additional listings of kings were recently found in two necropolis sealings in the tombs of Den and Qa'a in Abydos. The sealings show Narmer as the founder of the First Dynasty, who was then followed by Hor-Aha. Fact 3 on Narmer: History: He ruled as the king of Egypt during the period in ancient Egyptian history known as the Early Dynastic Period and was believed by many to be the king and founder of the 1st dynasty of the kings of Egypt. Fact 4 on Narmer: Family: The name of his parents is not recorded however the previous Thinite kings were recorded as Ka and Scorpion so it is possible that one of these rulers of Upper Egypt was his father. Fact 5 on Narmer: Prior to the 1st dynasty Egypt was divided into two lands. Lower Egypt = Nile Delta region of the north and Upper Egypt = Nile Valley region of the south. The family of Narmer was believed to have come from the south of the country in Hierakonpolis a center of ancient leaders and one of the strongest predynastic regional states. Another power base was the city of Thinis. Both were located in Upper Egypt (see map below). Fact 6 on Narmer: Narmer was involved in the disputes and campaigns aimed at Upper Egypt. He was eventually victorious as 'the conqueror of lands and the master of his vanquished enemies'. Fact 7 on Narmer: The Narmer Palette was found at Hierakonpolis and depicts the unification of the two lands of Upper and Lower Egypt and the king is represented wearing both Egyptian crowns - see image below. 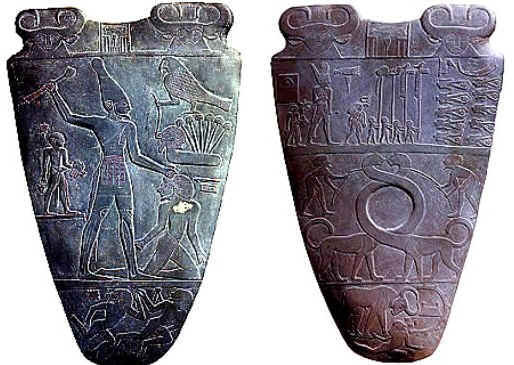 Fact 8 on Narmer: The pictures engraved on the palette depict the events that led to the unification of Egypt and how King Narmer vanquished his enemies. On the front of the artefact the king is shown wearing the White Crown of Upper Egypt, and in the front he wears the the Red Crown of Lower Egypt, clearing indicating he is the ruler of both the lands and therefore initiating the unification of Upper and Lower Egypt. Fact 9 on Narmer: The palette also depicts ceremonial of sacrifice of the defeated. Fact 10 on Narmer: During this period in ancient Egyptian history religious ceremonies included the practise of Human Sacrificeas part of the royal funerary rituals. Human sacrifice ensured the Pharaohshad servants in the Afterlife. Discover fast, interesting fun facts about Pharaoh Narmer for kids with some amazing, cool and quick information about ancient Egypt and Egyptians. Ideal for children, homework, schools, teachers and kids of all ages! Find fascinating fun facts about Narmer for kids and the history, culture and civilisation of the ancient Egyptians and ancient Egypt. Interesting, fun facts about this king of Egypt for research, schools, students and kids of all ages. Learn about this ancient Egyptian pharaoh the fast and easy way via the Narmer Fact sheet. Fact 11 on Narmer: The conflicts between the two lands continued and the first warrior kings of the dynasty persisted with their military campaigns aimed at the unification of Upper and Lower Egypt. The unification of ancient Egypt was not completed until the end of the 2nd dynasty. Fact 12 on Narmer: Family: He married Neithhotep, whose status and title was the "Foremost of Women". This was primarily a political marriage. Neithhotep was a princess of the Nile Delta region of Lower Egypt and this marriage to Narmer sealed the alliance as he was the Thinite king of Upper Egypt. Fact 13 on Narmer: Queen Neithhotep gave birth to the heir to the throne who was called Hor-Aha. Fact 14 on Narmer: The first king was known to initiate an expedition into the eastern desert. He was therefore ambitious to extend the territories of Egypt and exploit the trade opportunities and natural resources of neighboring countries. He also initiated trade expeditions in the northern country of Canaan. Fact 15 on Narmer: He founded the Northern capital Memphis and its development and buildings were completed by his son Hor-Aha when he succeeded his father to the throne. Fact 16 on Narmer: Large tombs and temples to the gods were built at Abydos, Naqada and Saqqara during the 1st dynasty. The development of new astronomical instruments during this time had a significant effect on the culture and religion of the ancient Egyptians. Fact 17 on Narmer: Administration via a central government was initiated and further skills were developed in writing, art and architecture. Fact 18 on Narmer: Queen Neithhotep was buried at Naqada and the tomb of king was located at Abydos the traditional burial complex of ancient Egyptian rulers. Fact 19 on Narmer: The king was succeeded by his son Hor-Aha who continued with the work that had been started by his father. The following chart provides the names of the kings of the 1st Dynasty together with a map of ancient Egypt. Refer to Menes for information about this mysterious figure in ancient Egyptian history who is often associated with King Narmer. Learning about the ancient Egyptians and King Narmer inspires everyone to visit historical sites and undertake Egypt Travel and Tours to experience the wonders of this magical land at first hand. Many people choose to experience a tour of Egypt on a Nile Cruise stopping at the famous destinations and sites of Egypt such as the Pyramids of Giza and the Great Sphinx. The information and facts about Pharaoh Narmer will provide you with a great insight into Egypt and the legacy of the ancient Egyptians.